Presented in honor of your commitment to conservation and environmental sustainability in your workplace and products. CP Lab Safety’s concerted effort to reduce its environmental impact should serve as a model for other small business looking to minimize their carbon footprints. From moving manufacturing from China to the U.S. to limiting paper use in shipping and marketing to innovating products that reduce toxic vapor emissions, CP Lab Safety has had a lasting and positive effect on our community and our planet for two decades. Thank you for your outstanding commitment to green business practices. “We are honored to be recognized for our commitment to conservation and environmental sustainability, and we look forward to fulfilling our vision to be the best safety company in the world, and to keep people healthy and safe around the globe." CP Lab Safety, inventor of ECO Funnel®, started in 1996 as a single-product small business with the big dream of making laboratories healthy and safe through the use of their flagship product. ECO Funnel, a patented safety funnel which reduces toxic vapor emissions in the environment up to 99.9%, has revolutionized the way hazardous liquid waste is handled in labs across the world. Over the past 20 years CP Lab Safety has evolved into an important environmental activist, maintaining ‘green’ business practices and encouraging the use of pollution-reducing and sustainable safety products. In the early 1990’s company founder Dr. Ron Najafi , a Ph.D. chemist noticed that common chemical waste handling procedures were inadequate for optimum health and safety, and also for meeting new EPA regulations. He observed that improper waste handling led to the contamination of the lab and surrounding environment, increased water pollution, elevated the risk of lab fires and exposed workers to unsafe chemicals and toxic fumes. Dr. Najafi used his industry knowledge to develop a product to address his concerns and ECO Funnel was born. Originally known as Safety Ecological Funnel, Dr. Najafi’s invention has provided a simple, safe and easy way to contain hazardous liquid waste for 20 years – reducing exposure of laboratory workers to toxic, flammable fumes and containing environmental pollutants. Dr. Najafi remains an innovator. He moved on to found NovaBay Pharmaceuticals and Emery Pharma Services in Emeryville, California. Ron has been an advocate for eliminating antibiotic usage as growth promotors for food animals and educating public about hazards of throwing away old antibiotics in the trash that ends up in landfills and ultimately in our streams and waterways. In 2003, Kelly Farhangi took over the business with the continued mission of Keeping People Healthy & Safe. 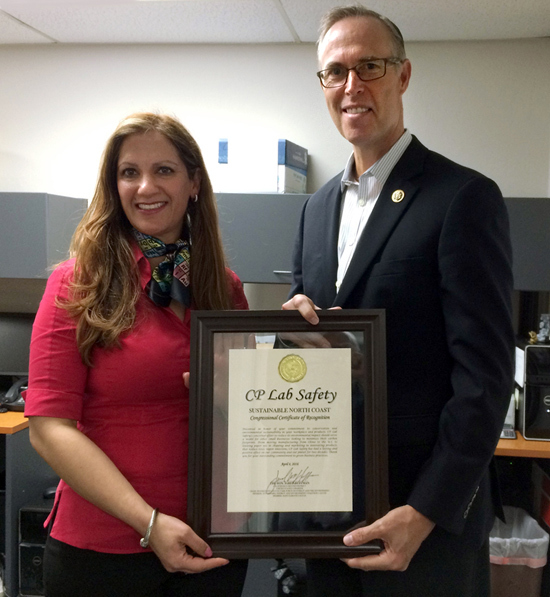 Since then, CP Lab Safety has grown rapidly, acting as a Steward of the Environment and making a noteworthy contribution to safer workplaces all over the world. In an effort to reduce the company’s carbon footprint, CP Lab Safety brought the manufacturing of ECO Funnel back to United States from China in 2009 . This action helped create local jobs, gave back to the American economy and reduced the environmental impact due to long-distance shipping. CP Lab Safety is now officially recognized as a Woman Owned Business, California State Certified Small Business and a GSA Contractor . CP Lab Safety’s positive impact has changed environmental practices in laboratories around the world and will continue to do so in the future.